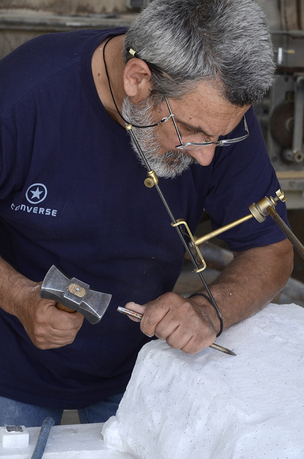 Michalis Janoupinos (interviewed by Allyson Vieira in Athens), a third-generation marble carver who now is responsible for the rigging, removing, moving, and replacing of the ancient and restored blocks, monitors and adjusts the supports under an ancient block undergoing restoration as it is lifted and rotated with a crane (2016). Photo: Allyson Vieira. 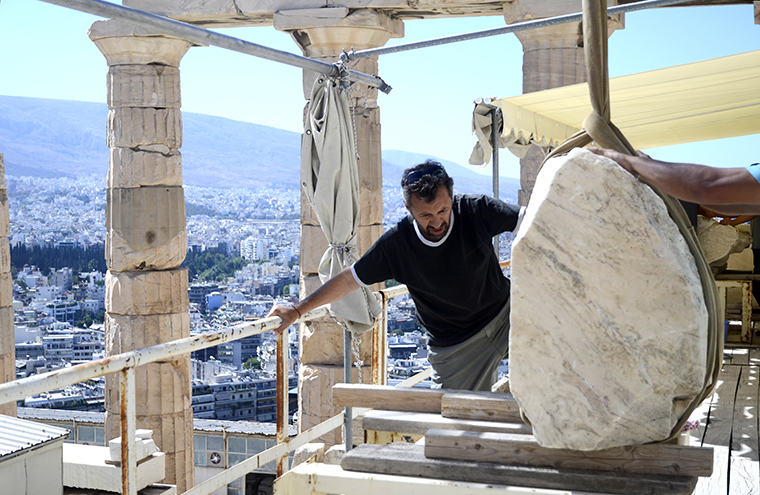 The marble workers laboring on the decades‐long restoration of the Acropolis are the invisible force rebuilding one of the world's most storied monuments. 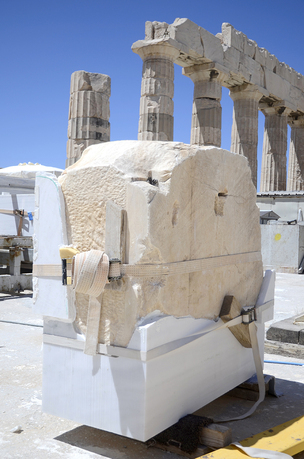 Inheritors of millennia-old tradition, few carvers exist today; fewer pass the Acropolis entrance exams. 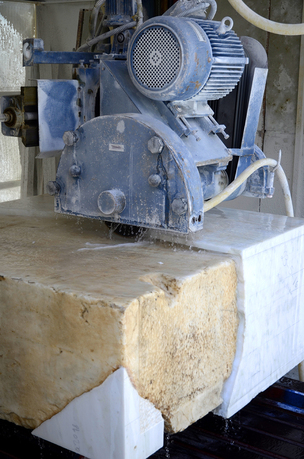 Their work is a highly technical amalgam of past and present, yet what these master marble carvers do and how they do it has remained undocumented until now. As the restoration enters its final phases, this timely book of interviews explores the workers' craft, techniques, training, and specific roles within the restoration in their unique and deeply personal voices. Concurrently, the book considers Greece's political and economic crisis from the workers' position. Amidst crippling unemployment, work on the Rock continues, despite radical cuts. 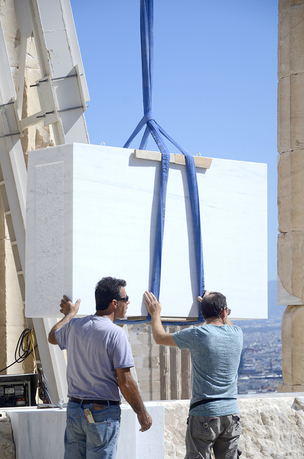 How has the Greek crisis affected the technicians' thoughts about their craft, jobs, and citizenship? On the Rock: The Acropolis Interviews explores the intersection of these issues. 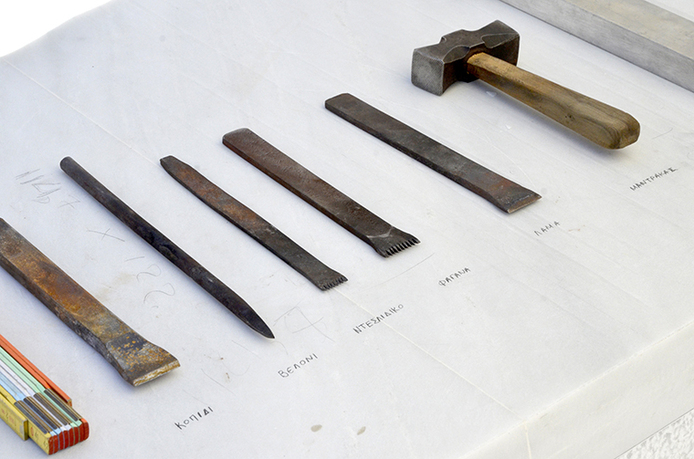 Allyson Vieira earned her MFA from Bard College and her BFA from the Cooper Union. Viera exhibits internationally, and her solo exhibition, The Plural Present (Kunsthalle Basel, 2013), which traveled to the Swiss Institute, NY (2013–14), was published in the form of an exhibition catalogue by Karma Books (2016). Her other international exhibition venues include ISET Contemporary Greek Art Institute, Athens, Greece (2016), PinchukArtCentre, Kiev, Ukraine (as a Future Generation Art Prize finalist; 2014), and Non-Objectif Sud, Tulette, France (2013). Stateside, Vieira has exhibited at Storm King Art Center, NY (2015); Frieze Projects, NY (2015, 2014); Philbrook Museum of Art, OK (2013); Santa Barbara Contemporary Arts Forum, CA (2013); Public Art Fund, NY (2012); the Highline, NY (2012); and SculptureCenter, NY (2010). Her recent gallery exhibitions include Company Gallery, NY (2017); Klaus von Nichtssagend, NY (2017); Daniel Faria, Toronto, CA (2017, 2014); Mendes Wood DM, São Paulo, BR (2015); The Breeder, Athens, GR (2014); Laurel Gitlen, NY (2013, 2010); and Monica deCardenas, Milan, IT (2011).